Classic Horror Movies Like The Evil Dead (1981) '+g+"
The Evil Dead is a 1981 American horror film written and directed by Sam Raimi. The plot involves five college teens Ash (Bruce Campbell), Linda (Betsy Baker), Cheryl (Ellen Sandweiss), Scott (Hal Delrich) and Shelly (Sarah York) who arrive at a isolated cabin surrounded by impenetrable woods for a vacation, finds an audiotape containing incantations from ancient book of the dead. When they play the tape it unleashes unspeakable horror for the teens who are possessed one by one by flesh-possessing demons. 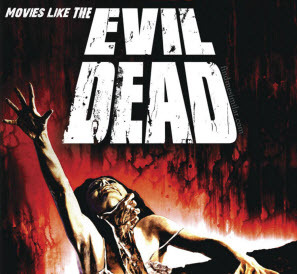 If you like horror movies like The Evil Dead then find the recommendations for it below. Obviously, it goes without saying that the closest movies like The Evil Dead are the sequels (Evil Dead II and Army of Darkness), so those are not included in the list see them if you haven’t already and don't forget to mention if we miss any as we keep on updating this list. Dead Alive is a 1992 horror movie co-written and directed by Peter Jackson. It is considered as one of the most violent, gory horror films of all time. The story revolves around a young' man who tries to keep the secret of his demanding mother turning into a blood-hungry zombie due to the bite from Sumatran Rat-Monkey. Drag Me to Hell is a 2009 American horror film, directed by Sam Raimi. It is a story of loan officer who refusing to extend a loan to an gypsy old woman and finds herself the recipient of a supernatural curse. Desperate, she turns to a seer to try and save her soul, while evil forces work to push her to a breaking point. Drag Me to Hell won the award for Best Horror Film at the 2009 Scream Awards and the 2010 Saturn Awards. The Return of the Living Dead is a 1985 American horror movie written and directed by Dan O'Bannon. The movie tells the story of how three men (Clu Gulager, James Karen and Don Calfa) accompanied by a group of teenage punks deal with re-animated brain hungry zombies. Re-Animator is a 1985 science fiction horror movie based on the book "Herbert West–Reanimator" by H. P. Lovecraft. The movie is extremly gory, with a combination of horror and comedy. It's the story of a dedicated medical college student Herbert West (Jeffrey Combs) involving in a bizarre experiment of re-animating fresh corpses and messy consequences with it. Night of the Living Dead is a 1968 horror movie directed by George A. Romero. The story revolves around Ben, Barbra and five others people trapped in a rural farmhouse hiding from the attack of undead zombies. The Texas Chain Saw Massacre(1974),......if you can think of more, then don't forget to mention it in comments.